Osmo comes with a nice padded case which resembled a mini-guitar. It also comes with an internal as well as an external mic. A 16GB MicroSD card is also included as well as a single battery and battery charger. A silicon lens cap is also included. Optional extras include spare batteries (you NEED at least one spare), as well as a variety of mounts which allow use of the Osmo on bicycles, tripods, extension poles, etc. Kudos for DJI for providing the memory card and case – it’s nice to open a box and have a product which is ready to use without having to order additional items. A smart device (phone – up to 5.5″ screen) is needed to complete the package. IOS or Android software is available. If you use IOS (Apple), you will need an iphone 5s minimum, if you use Android be sure to check with DJI and/or other users to be sure of compatibility. Wedding photographers, real estate agents, design and construction firms, video hobbyists, action sports participants and/or anyone else who desires stable video from a handheld portable device. Many drone pilots will want Osmo so that their ground-level video footage closely matches that of their aerial shots. Osmo is not for everyone – if the video you take with your smartphone or camera is good enough then it’s unlikely you’ll want to deal with carrying around yet another device. Some phones and cameras have built in IS (Image Stabilization) which may be good enough to satisfy some consumers. The Osmo, however, uses full mechanical stabilization making the results far superior to what you will get from most other handheld cameras. The Osmo also takes impressive still photos – a nice extra which means you can use is as a “walking around” camera in addition to the video capabilities. The superior stability means it can do a great job with slow shutter speed – such as when you take pictures in low light or at night. Video output from the Osmo will be more “future proof”. It’s likely that all cameras will be stabilized someday and having Osmo footage of that family reunion or new baby will stand the test of time better than the jerky cell phone videos you may be taking now. Your kin and posterity may appreciate your forward thinking as they won’t get dizzy watching their great grandfather (as a 2 year old). The Camera on Osmo is powered by Sony’s 1/2.3-inch 12-megapixel sensor and can record videos of up to 4K resolution. Spec are for 4,096 x 2,160 at 24fps or 3,840 x 2,160 at 30fps/24fps. For smoother video, you can go up to 60fps at either 1080p or 720p, or slow motion with 120fps at 1080p. 1. Unbox – charge battery using included charger and install into Osmo. Open and read the Osmo Quick Start Guide (included) or read online at DJI Osmo Support Page. 2. Install the DJI Go App on your smart device – if you already have the Go app for use with your DJI Phantom you can skip this step. 3. Install your Smart Device in the Osmo holder. 4. Remove lens cap. Unlock the Osmo gimbal by rotating slightly – use the directions in the quick start guide. Unlock the pan axis by pushing down on the switch with the lock/unlock icon. 5. Turn Osmo on using the power switch. If the gimbal is properly unlocked Osmo will come to attention and the gimbal will center itself. 7. 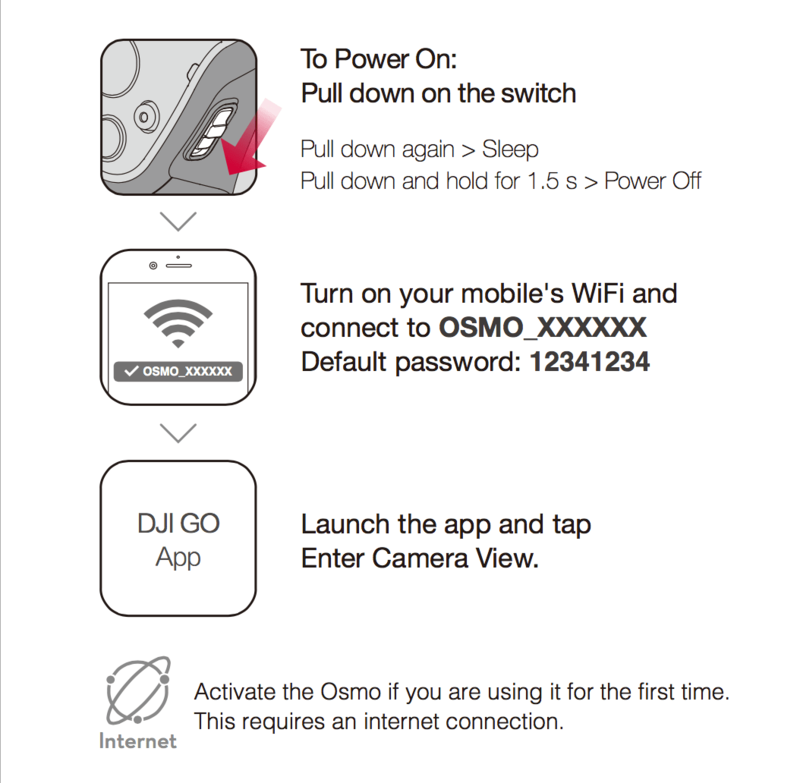 Open the DJI Go App on the smart device – if it is your first time using Osmo you will be prompted to login to your DJI account – which registers your unit. 8. If your Osmo firmware is not up to day you may be prompted to upgrade- this can be done through the app and will take a few minutes. There are alternative ways to upgrade the firmware by downloading it onto the SD card (from your computer) and then inserting it into Osmo. 9. Press the “Camera” button on the DJI Osmo Go App screen – now you are ready to use Osmo. As is typical with this type of device, many of these steps felt cumbersome the first time I attempted them. However, after using Osmo 2 or 3 times everything worked perfectly and unlocking it as well as using the built-in wireless network became second nature. Don’t get frustrated if something does not work the first time – try and try again and you will find it’s a fairly simple device to use. 1. A Trigger – this is used for centering the camera and also for turning it 180 degrees to take a selfie.This is the only hardware control on the front (subject facing) side of Osmo. 2. A Joystick (small button) which is used to move the camera up-down and left right. The gimbal on Osmo can also be operated (turned) with your fingers. The App allows for a vast number of settings as well as camera control and more. A benefit for DJI Phantom owners is that they are already familiar with the DJI App, therefore allowing or an easier transition to Osmo. It is beyond the scope of this “first look” to describe all the creative and unique modes and uses of Osmo, however we will link to a number of articles and videos at the bottom of the page so the reader can explore the possibilities. For an initial test I held the Osmo on my bike and took a quick ride around the block – then I did the same with the iphone 6s. These videos are both taken at 1080p 30fps. As you will see, the Osmo is much smoother due to the stabilizing gimbal. Unless you have a high resolution screen or TV to watch this on, you will not get the full 4K. Be sure to change the youtube settings for full 4K (it defaults to HD). Here is a youtube video with a number of sample clips taken from a park in Sarasota, Florida. Note that those proficient in the use of Osmo can do away with some of the jerkiness of walking by mounting it on a wheeled stick. One user said his electric skateboard was the perfect platform, although I suppose anything of the sort – even walking alongside a bike – would flatten out some of the walking movements. Those who are creative can come up with various other mounts and methods to get the footage they desire. Osmo features a built-in microphone but also comes with a small external mic. DJI has received complaints that the built-in mic can pick up some noise from the gimbal (stabilizer) motors as well as from an interior cooling fan. An external mic will do away with most of this motor and fan noise. Various other mics can also be used for those who desire more professional audio. An almost endless variety of accessories and add-ons are available for Osmo – many from DJI and some from 3rd parties. Here, for example, are some of the mounts and other accessories DJI offers. Various other add-ons can be found on Amazon, Shapeways and through your favorite search engine. We suggest you buy the genuine DJI batteries for Osmo. 3rd party batteries are available but in our opinion the small savings are not worthwhile. The Osmo does what it is advertised to do, is of high quality and is priced well. It essentially brings 80% of the capabilities of “pro” stabilized rigs to the masses for 10% of the price. That said, it is rarely going to be a “must have” for the casual video producing consumer. Sure, it’s better than most cell phone video but a steady hand and decent editing can make iphone or high-end android video good enough for most users. This puts it squarely in the “specialty” market – it will appeal to gadget and technology freaks as well as those who desire the smooth video output at a bargain price. 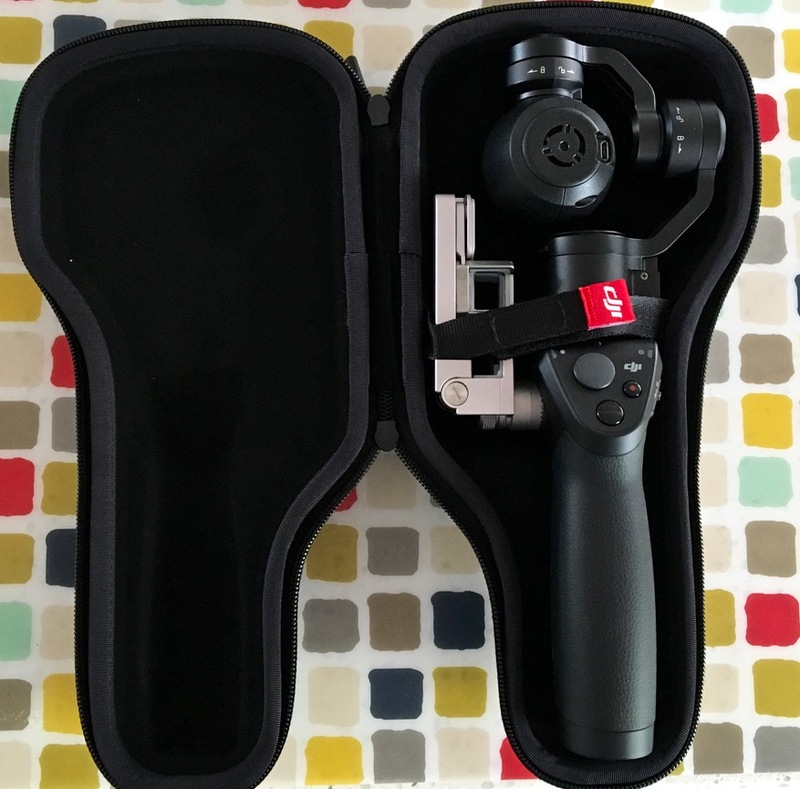 Alternatives to the Osmo include handheld gimbals designed to mount a smartphone or a GoPro. These cost less than the Osmo but don’t have the same features or capability. Also, many of the companies selling these do not have US offices and support – making customer support a potential problem. 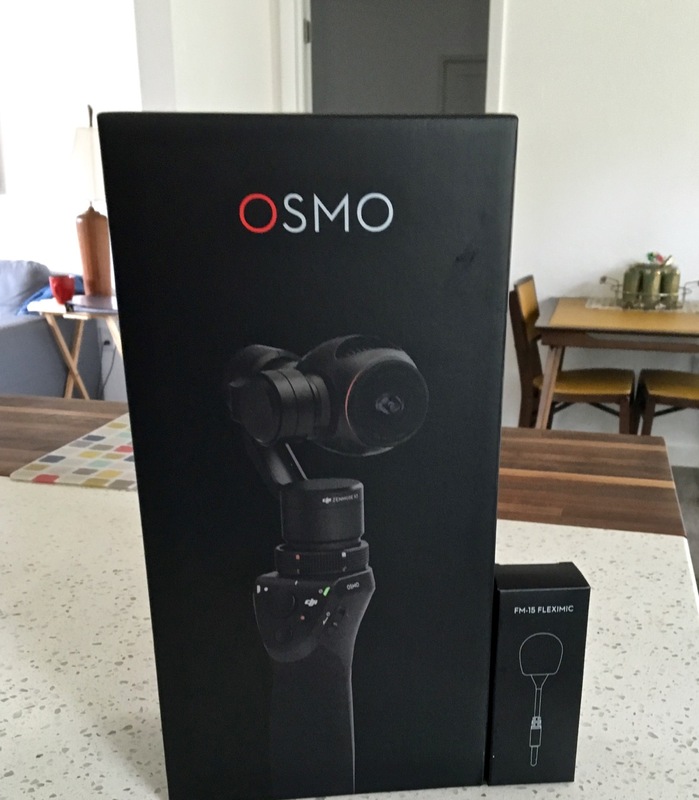 In fact I was considering purchasing one instead of the Osmo but decided against it due to the lack of customer service. Below is shown one example of a well regarded smartphone gimbal. As always, we let prospective buyers make their own decisions – based on our review and others it should be easy to decide if a handheld stabilizer can be useful for your video pursuits. DJI products are full-featured – but getting the most out of them requires study, patience and a desire to unlock the deeper capabilities of the Osmo. If you are already a photography and video enthusiast you will be well on your way due to having understanding of the various camera settings and options. Once those are mastered you can move on to the many techniques, tricks, mounts and hacks that will allow Osmo to become more than a one-trick pony. Some links to get you started on your quest are below. DJI has a series of Osmo tutorials – each of them is very short, but easy to watch. All of them are linked on this page. If you want to see what a Pro can do with Osmo, check out this “hyperlapse” video of Saigon. Note: Feiyu Tech also offers gimbals for GoPro as well as Sony Action cameras – use the Amazon or Banggood links above and search for Feiyu.